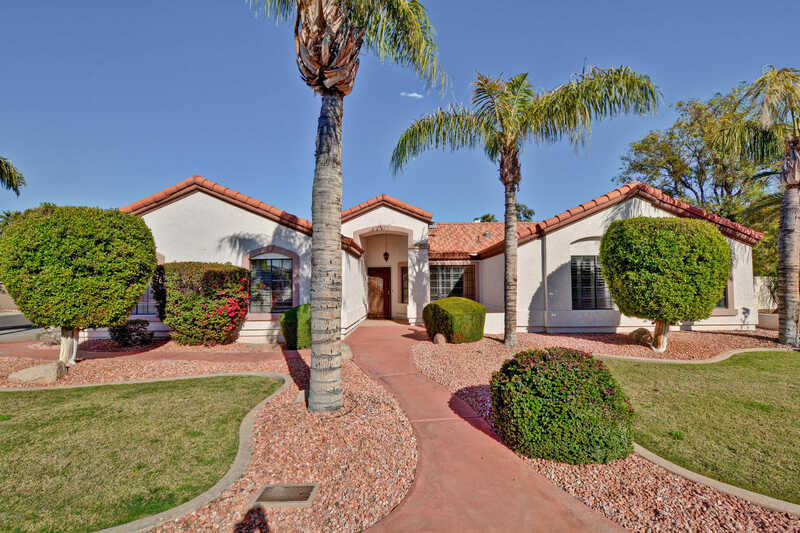 Beautiful Custom Built, Cul-de-Sac, Corner Lot Home, located in the heart of the highly desired Arrowhead Ranch Community, surrounded by Golf Courses, just blocks from Arrowhead Country Club and endless Shopping, Dining & 101 Freeway. You’re sure to love this move-in ready, 4 bedroom, split floor plan with versatile living space, plantation shutters thru out, double door master entry, vaulted ceilings, french doors to covered patio, just to name a few. Many newer & recent updates include kitchen appliances, carpet & wood flooring, heat pump, water heater, garage door, light fixtures, pool pump & motor. The backyard is very private, low maintenance & wonderful for entertaining with pebble tec pool & ramada. The double side gate & large side yard is perfect for easy access and storage. Directions: Bell Rd North on 75th Ave to Wescott, East on Wescott to 18997 N 74th Dr, property on corner*OR*101 Aqua Fria Fwy South on 75th Ave to Wescott, East on Wescott to 18997 N 74th Dr, property on corner. Approximate size: 7941.00 sq. ft. Please, send me more information on this property: MLS# 5899038 – $369,900 – 18997 N 74th Drive, Glendale, AZ 85308. I would like to schedule a showing appointment for this property: MLS# 5899038 – $369,900 – 18997 N 74th Drive, Glendale, AZ 85308.